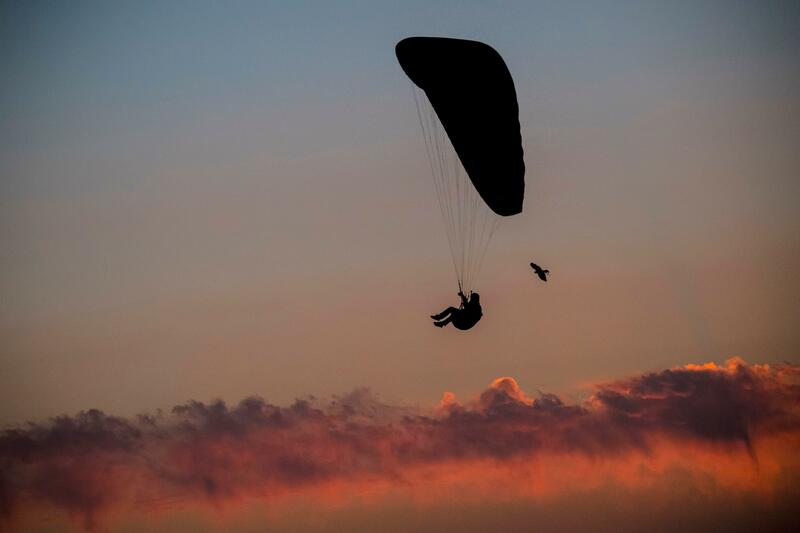 A paraglider fell 200 feet when his parachute collapsed near Golden in Jefferson County, Colorado, on Wednesday, but managed to survive. The incident was caught in a video by a hiker, who was hiking on a hogback. Kent Kovack was hiking near the Green Mountain in Lakewood with his wife and daughter when he witnessed the terrifying incident. He told Fox 31 that he whipped out his cell phone to record the incident after his daughter thought his fall was an impressive midair maneuver that the paraglider was trying to pull off. “My daughter heard him yelling, like, ‘Woo hoo,’” Kovack said. However, the reality soon became apparent to Kovack when he saw that the 45-year-old man showed no signs of slowing down as he neared the ground. Public Information Officer Ronda Scholting said the West Metro Fire Rescue responded to the scene and found the paraglider conscious and talking. He was rushed to a nearby hospital for treatment. "The winds were pretty erratic yesterday," Scholting said. "He kept being blown away from the landing spot and then his chute suddenly deflated and then he fell, he said, about 200 feet to the ground." “Could be a potentially dangerous area just because the winds could be very erratic coming off the hogback along 470 and, you know, up into the Golden areas," Scholting said. "So, you have to probably be a pretty experienced paraglider in order to do this safely." According to the fire department, the man’s parachute collapsed as a result of "erratic winds.” “Once you see the video, you realize he’s a very lucky man. God was on his side today,” Kovack said. Will Stites, president of the Rocky Mountain Hang Gliding and Paragliding Association, told 9 News Thursday that the paraglider will make a full recovery following the fall. "I can tell you that the pilot will make a full recovery and is doing just fine," Stites said. "Paragliding is a very safe endeavor by and large. Unfortunately, events like this do happen from time to time but, with proper training, it is pretty rare." At the same time, the association also put out a video and flying guidelines to alert paragliding pilots of the changing conditions.